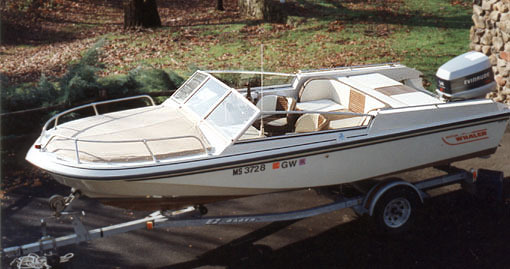 The GTX was a "sport" boat built from 1982 - 1986 on the classic 18-foot vee-hull of the more popular Outrage series. 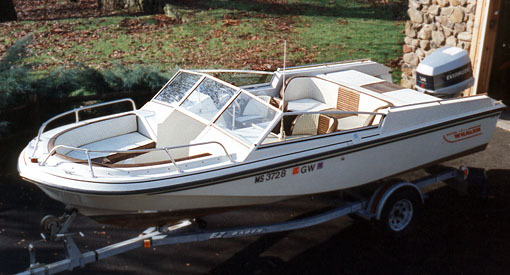 In many ways the GTX was an extension of the Newport model available in the 17-foot hull. The interior is in the style now known as a "bowrider" and featured dual side consoles with a walk-through windshield. Twin bucket seats were provided at the helm and port consoles, upholstered benches wrapped around in the bow, and a wide upholstered seat filled in the rear of the cockpit. Behind the rear seat is quite a large area which provided space for mounting an engine and I/O stern drive. 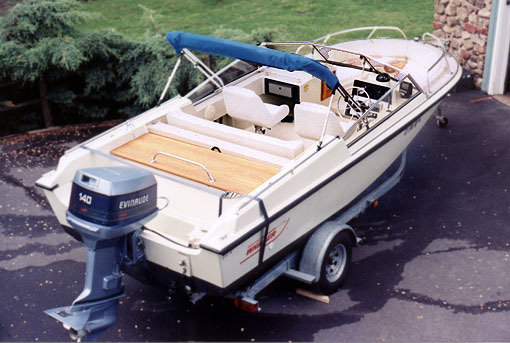 The I/O powered GTX was the most common, but Tom Desmarais <TD1AXIOM@aol.com> once owned an outboard-powered GTX model. Thus our photographs are of his quite rare boat. The front cockpit is covered with canvas. The upholstered seats are in their factory original trim. On the transom is a 1986 140-HP Evinrude. Beneath the cover the bow cockpit contains wrap around upholstered seats. In profile on the trailer. The black bottom paint hides the classic hull lines somewhat. The interior after some modifications. 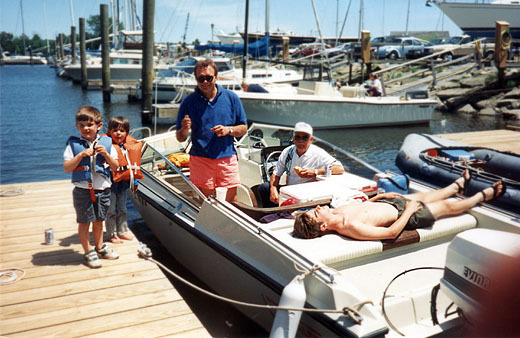 L-R: Nick, Mike, Tom, Bob, and "Ridge" (lounging). The GTX accomodated all ages and sizes for Whalering. What could be better than beautiful weather, a great boat, and your family enjoying a day on the water?